Tokyo's Top 5 Districts to Eat, Stay, & Play. Deciding where to stay in Tokyo can be a challenge, especially with so many great districts to choose from. The best thing about this bustling city is that once you’ve locked in your home base, all the other must-see areas of Tokyo are only just a short train ride away. Lucky for you we’ve compiled a list of our favourite Tokyo hotspots (and why we love them!) to help you decide! With a perfect combination of modern and traditional Japanese culture, Shinjuku is one of our go-to districts when Scout visits Tokyo. Scattered throughout the city are numerous temples to explore, and it can be quite easy to get lost exploring these historic monuments, so if you’re keen to check them out, a map is highly recommended. 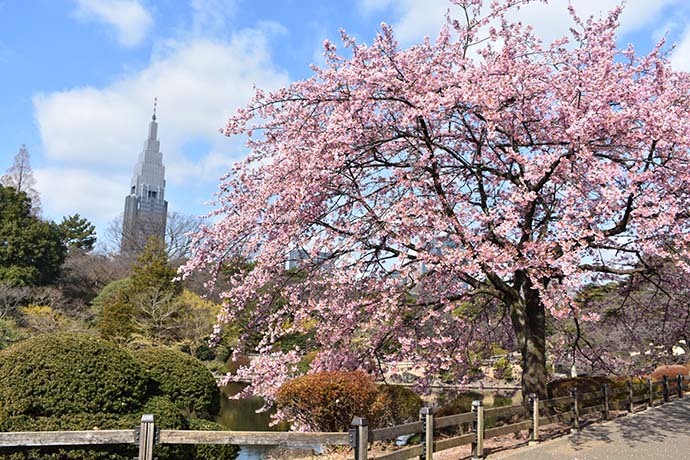 Towards the end of the ski season (think Spring, March – May) the cherry blossoms start to emerge, and a perfect spot to experience them in full bloom is at the Shinjuku Gyoen National Garden. Take a wander around the meticulously manicured pathways, and stand in awe of the multi-national landscaped gardens (perfect for those photo opportunities). Shinjuku home the busiest railway station in the world – with over 3 million people passing through daily. It’s a perfect location for access to other districts via the subway, or for connections through to the Shinkansen, ski resort areas, and airports. The Airport Limousine Bus also has a drop-off / pick-up point at the West Exit of the JR Station. If you’re looking for a unique night out on the town, Shinjuku delivers.Kabukicho has it all – bright neon lights, endless array of izakayas and bars, and even Godzilla himself, perched atop a shopping mall. Experience the famed Robot Restaurant, or descend one of the steep sets of stairs and pull up a stool at the bar alongside the local businessmen for a drink or two. 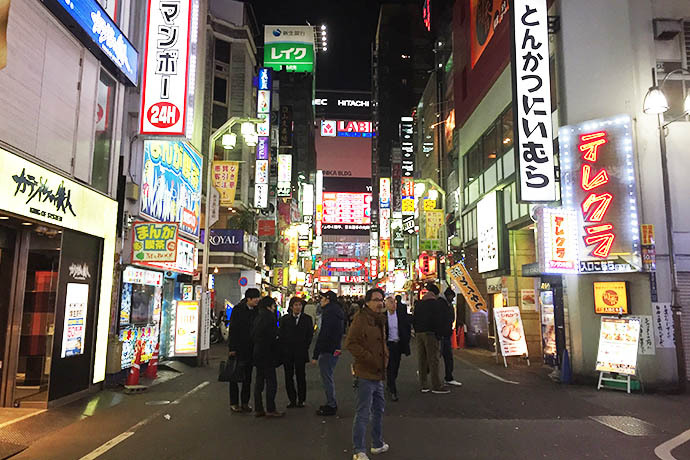 Known as the ‘red light district’ of Tokyo, Kabukicho is a bit of an eye-opener, but taken with a grain of salt it is a great spot to experience the fast-paced and eclectic side of Tokyo. 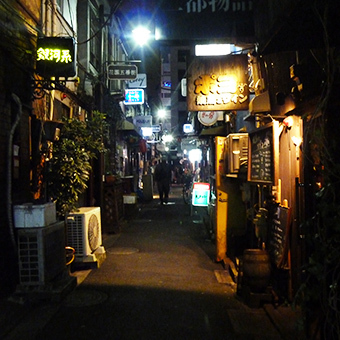 A short walk from the train station is our favourite little collection of bars, Golden Gai. Blink and you’ll miss these pokey bars; almost 200 in total all tucked away within a 6-alley radius (some so small they only fit 5 or 6 people!). One of the best places to rub shoulders with the locals, Golden Gai is definitely one of the friendliest and homely spots for a local brew. Being one of the largest entertainment, business, and shopping areas in Tokyo, there are plenty of opportunities to spend up big. Choose from over 6 major department stores, with some up to 11 stories high, and 3 leading electronics retailers. The best bit of all… you can shop till you drop until 11PM daily at many of the major complexes in Shinjuku! Looking for some great local cuisine? 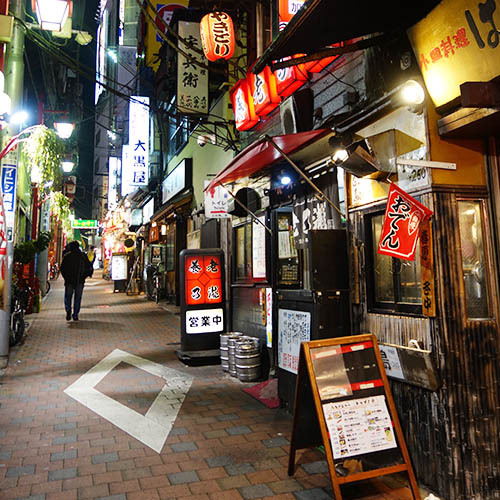 One spot to sample the best of Japan in Shinjuku is in a little area called Omoide Yokocho (aka ‘Piss Alley’ to Westerners) located just North of the JR Station. Originally an illegal drinking quarter in the 1940’s, you’ll experience a bit of ‘old Japan’ with this small collection of food stalls, yakitori grills, and hut-like bars, all serving some of the most delicious and authentic yakitori. Perfect for couples and families who are looking for a mix of old and new Japanese culture. Shibuya is best known for its zebra crossing – neon lights, giant video screens, and hundreds of people crossing this famous intersection at once. It’s a must-see when visiting Tokyo, and really easy to get to (if travelling by train, take the Hachiko Exit from the station). Grab a coffee at Starbucks and head to the first level of their Shibuya cafe – it’s the perfect spot for people watching and provides a great birds-eye view of the action below. The Shibuya Station is one of Tokyo’s busiest stations so expect the crowds, however, this also means convenient access via the JR and Subway lines from other districts. Shibuya is also along the Airport Limousine Bus route, so very easy access to both airports. Right in the heart of Shibuya is a fantastic pedestrian zone called Center Gai, where you can find a bevvy of restaurants, nightclubs and bars. The game centres are popular among the young locals, and are a unique spot for a drink and test your gaming skills. Escape the flashing lights and head to Nonbei Yokocho where you’ll find a multitude of traditional izakayas, and see Shibuya from a local’s perspective. The dimly lit alleys seem a little daunting but the friendly owners are welcoming and keen to test their limited English. For something a little nicer and one of Japan’s best city views, head to the top of Shibuya’s Cerulean Tower to Bello Visto, where classic cocktails and spirits (and piano entertainment) awaits. Being one of Shibuya’s premier bars, reserving a table is highly recommended. It’s not a trip Japan without an (embarrassingly bad) attempt at karaoke, and Karaoke-kan provides the perfect opportunity. Sit back and simply be entertained at the bar, or choose from an array of costumes and wigs and enjoy your 3+ minutes of fame. 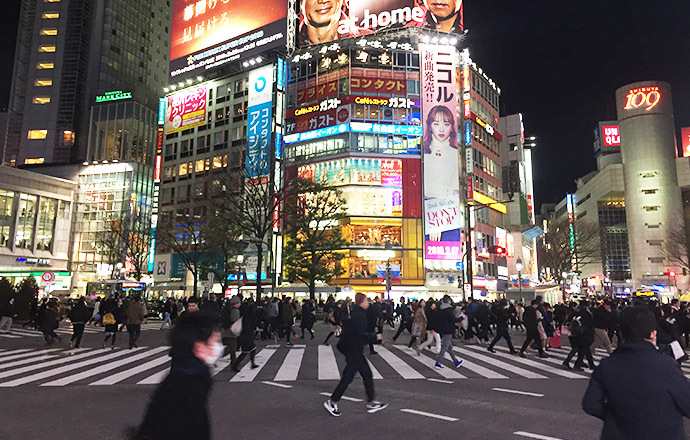 Many of Japan’s fashion trends are born out of Shibuya, so there is no wonder there are many large department and boutique stores to explore. Head to Loft for all your stationary, homewares, and lifestyle good, all spread across 7 massive floors. Fan of Uniqlo? Shibuya’s biggest shop is definitely worth checking out on weekends, especially for one of their flash sales. There’s even great record stores for vinyl lovers, with HMV, Disk Union, and Lighthouse Records offering both new and secondhand records (you can even try before you buy!). If you’re a keen second-hand shopper, there are also plenty of spots to find a one-off, Japanese-inspired vintage item. A few favourite of ours including Ragtag, 2nd Street, FOVOS, and The Sun Goes Down, are all within a block or two of each other, so you’re sure to score a great hand-me-down item. The story of Hachiko and the statue dedicated to the loyal canine. Beautiful Japanese folklore story and the monument out the front of the Shibuya Station makes for a great meeting point. 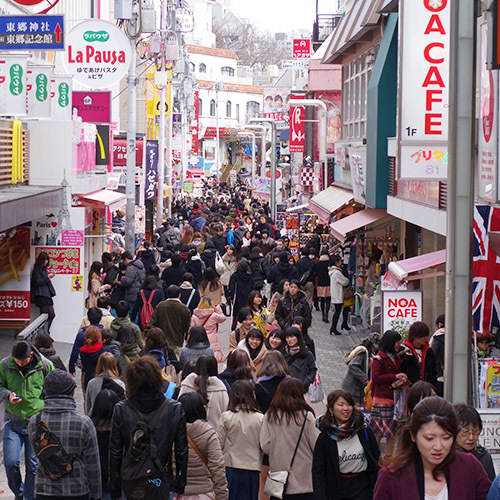 Perfect for shopping lovers (new and old style), and to experience the fast-paced Tokyo life. Nestled between Shinjuku and Shibuya is one district that is perfect for kids (and big kids at heart). Best known for its teenage culture, and eccentric fashion styles (including Cosplay), Harajuku is a must-see area when in Tokyo. It’s also only a few minutes along the JR Yamanote Line from Shinjuku, so not far off the beaten track. Despite it’s focal point being quirky fashion and kid-centralised shopping, Harajuku also has some wonderful temples, historic shrines, and Japanese gardens to explore. Directly behind Harajuku Station you’ll find Yoyogi Koen; one of Tokyo’s largest city parks. Popular for its cherry blossoms in Spring, and colourful Ginko tree forests in Autumn, the park is a great spot for a picnic, or just a relaxing stroll. 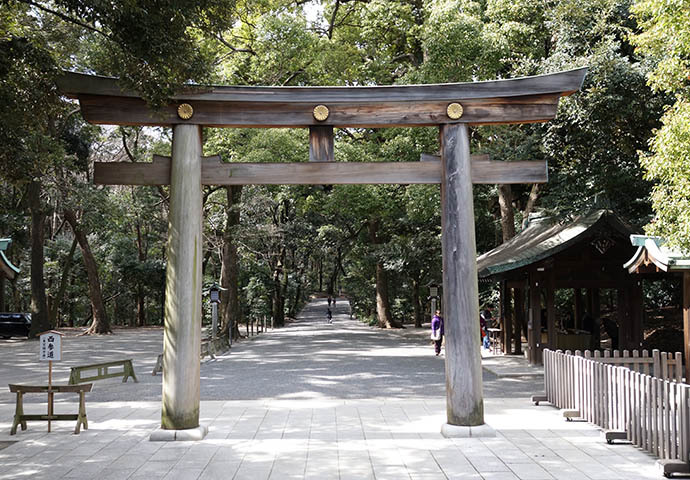 Just beside Yoyogi, you can also visit Meiji Shrine – a perfect spot to take part in traditional Shinto activities such as offerings in the main hall, buying a spiritual charms, or writing a wish on an ema (wooden plate). As you can imagine, Harajuku’s nightlife is just as peculiar, with some of the most innovative and creative bars and restaurants in Tokyo. From aquarium restaurants and 1920’s speakeasies, to Spanish villas and Turkish harems, there is a definite eclectic mix of options to choose from. Fancy visiting an office-themed novelty bar? Allow the photocopiers, desks, and water coolers set the scene for your evening drinks at Office. Harajuku also caters to those who are keen to enjoy a traditional Japanese bar atmosphere. 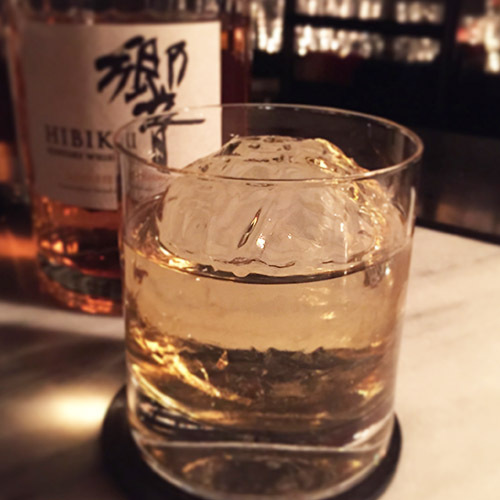 Den, modeled on a Kyoto ryokan, specializes in single malt whiskeys and provides both private rooms and a quaint bar area for your sake sipping needs. Open late into the evening, the Chamao Cat Café is a fun option for the whole family to start your night off, or wind down your day. Enjoy a relaxing cup of tea, and the company of a kitty on your lap, and soak up the great views of the surrounding Harajuku nightscape. Take your taste buds on a tour of the best Japanese street food in Harajuku. Gindaco serves up some of the best Takoyaki (octopus balls), perfect for a quick snack on the run, or head to Pablo Café for the smoothest and creamiest cheese tarts in Tokyo. Gyoza Lou is a local institution and once you try these heavenly (and addictive) grilled gyozas, you’ll be coming back for more. Here’s a spot where kids rule the roost when it comes to shopping. Kiddy Land is a Harajuku institution, having opened over 60 years ago, and housing 5 levels of toys, specialty character toys (think Snoopy and Hello Kitty), Lego, and other Japanese nick-nacks. Expect a sensory overload, but it’s great fun for a spare afternoon. Takeshita Dori is also a well-known spot in Harajuku, with lots of shops to browse and fill up on quirky trinkets and souvenirs. It can be somewhat crowded at times, however, a perfect spot for boutique shopping. More interesting shops and cafes can be found down the side streets, so don’t be afraid to wander away from the crowds. Enjoy a loaded crepe at one of the many shops along the laneway, or regain your energy with a huge rainbow fairy floss. The purikura photo booths, located towards the Harajuku Station end of Takeshita Dori are also a fun way to capture moments of your trip to Tokyo. The 1km tree-lined avenue of Omotesando is worth a stroll if you’re seeking more upmarket and brand-named stores. Along here you will also find Omotesando Hills and La Foret Harajuku; multiple floored shopping complexes, with endless fashion boutiques (Louis Vuitton anyone? ), lifestyle shops, cafes, restaurants, and beauty salons to choose from. Beautifully made coffee to start the day. Harajuku is home to some of Tokyo’s most skilled baristas, so take a stroll and you’re bound to stumble upon a café or two. Our favourite? Good Town Doughnuts, for a hearty brew and sugar kick to fuel up for the day ahead. Perfect for families and endless laughs, and a quirky afternoon spent souvenir shopping. Tokyo Station is often the first entry point to Tokyo for many travellers, being the main gateway to the Shinkansen and easy access to nearby districts. Surrounded by high-rise hotels and office buildings, the area has a very Manhattan-esque feel, and is home to great shopping, amazing dining options, museums, and art galleries; everything a visit to Tokyo needs. Stroll around the wide boulevards and immerse yourself in the past-paced business side of Tokyo, or head a little West of the station to the Imperial Palace (home to the Emperor of Japan) and Kokyogaien National Gardens (stunning area to see the cherry blossoms in full bloom). A popular activity is to also wander the underground streets of Tokyo Station – these interconnected subways are lined with countless souvenir shops and eateries. 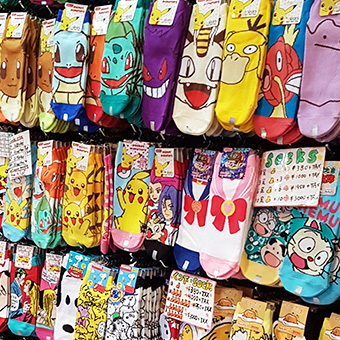 Character Street is a must-see – a long passageway filled with shops selling Japanese animated characters, as well as Tokyo Ramen Street – 8 of the best ramen restaurants in Tokyo! Many of the local buildings are accessible via this vast network of passages, and you can even walk all the way to neighboring district, Ginza. If you find yourself with a long wait at Tokyo Station, there is plenty to see and do to keep everyone entertained. There are endless options for entertainment once the sun goes down on Tokyo. A popular choice is to head to the top floors of one of the high-rise buildings at Tokyo Station, and enjoy a nice meal and the surrounding illuminated Tokyo skyline. Also at the station itself (second floor) you’ll find a spot for the whiskey lovers, Bar Oak; from malt to blended varieties, Canadian to Irish, you’re bound to experience the rarest and best quality beverages in the city. Being a stop for many travellers, Tokyo Station and Marunouchi has an array of 5-star hotels, and although you might not be resting your head there for the night, you can still experience top-notch dining and entertainment. At Motif Restaurant and Bar (Four Seasons Hotel) you can choose from 3 distinctly different bar settings, each suited to your mood; enjoy a 270 degree panorama view of the city in the Social Salon, cosy up by the fireplace in the Living Room, or experience the best local product at the Gastronomic Gallery. 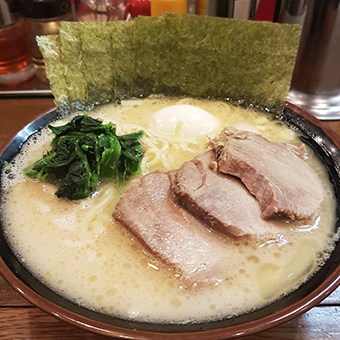 Travel only one stop South on the JR Yamanote Line and you’ll be in the heart of one of our favourite restaurant districts to visit when in Tokyo. Yurakucho, built under the brick arches of the elevated train tracks, boasts over 700m of restaurants, bars, and eateries. Many are authentic izakaya and yakitori dens, perfect for a casual meal and beer, however, you can also find elegant French wine bars, Italian restaurants, and even German beer halls. The Tokyo Station and Marunouchi districts have received major facelifts in the past few years, with new shopping complexes and multi-story buildings offering the best shopping experiences for travellers to Japan. Most are open until 9PM daily (10PM on Sundays and public holiday), which helps when among the endless floors of fashion, interior goods, and trendy restaurants. Head to Marunouchi Brick Square for specialty shops, Oazo for its incredible 4-floored bookstore, and Kitte for its rooftop garden. The tree-lined shopping street of Nakadori Avenue spans the whole length of the Maranouchi district between large shopping and office buildings, and is occupied by numerous chic cafes, fashion boutiques, and specialty shops. It’s closed during lunchtime to motorized traffic and a great space to wander the afternoon away. It’s hard not to spend a few hours within the Tokyo Station itself on the first-floor basement level. Gransta (and Gransta Marunouchi) is actually located both within and outside the ticket gates, and offer a vast array of souvenirs, rare items, last minute gift ideas, and general goods. You’re sure to find a quirky item to commemorate your travels to Tokyo! Winter illumination displays throughout Tokyo. Don a nice warm jacket and take a stroll down Nakadori Avenue at nighttime for a beautiful and romantic Tokyo evening. Between December and mid-February, the streets are decorated in over a million LED bulbs creating a laneway of twinkling champagne gold trees. Perfect for those wanting to be in the heart of Toyko, close to the main train station, and a bit of everything. When it comes to nightlife for travellers, you can’t beat Roppongi. Offering an endless array of friendly bars, nightclubs, and restaurants, it’s no wonder this district has become home to a large community of expats. Only 15 minutes via subway from Tokyo Station, and 10 minutes from Shinjuku, the area is easily accessible to those visiting for a memorable night out on the town. Alongside it’s entertainment factor, Roppongi has a reputation as a cultural hub, with several art museums, an observation deck for stunning city views (the Mori Tower), and entertainment facilities. Japan’s largest art museum, the National Art Centre, is a must-visit when in Roppongi, alongside the Suntory Museum of Art for some incredible traditional Japanese art. The district is divided into 3 great mini-cities within the city, all barely minutes away from eachother; Tokyo Midtown, Roppongi Hills, and the Central Nightlife District. For those wanting city views, and stylish accommodation and shops, Tokyo Midtown answers your call, with the tallest building in Tokyo (the Midtown Tower), and the Ritz-Carlton Tokyo at its centre. Roppongi Hills hosts a great observation deck, museum, and tourist attractions such as numerous restaurants, shops, and movie theatre. The Central Nightlife District is easily navigated, incredibly foreigner friendly, and caters to all your bar and club needs. Roppongi has created a name for itself as a nightlife hotspot in Tokyo. Bright neon lights, friendly bars, and endless clubs, pubs, and restaurants to choose from, this district has become a must-visit spot for visitors searching for a good time. Gaien Higashi Dori is home to the majority of Roppongi’s best clubs and bars, and it’s always a fun experience wandering along this main street to find your venue of choice. If you’re after a bit of a dance, you’ll definitely find the classic clubbing experience (think mirror balls, chart hits, and smoke machines) at one of the pumping nightclubs (entry fees apply and can vary depending on the night of the week), or hone your salsa skills at Salsa Sudada, one of Tokyo’s longest running and best loved salsa clubs. For something a little more relaxed, there are variety of British-style pubs, American bars, sports cafes, and romantic lounges. Generally, the food is great across the board, and reasonably priced. For fans of live music, there are also super cool little venues scattered throughout the district, including SuperDeluxe and Kentos, and you can’t go past a Japanese Beatles Tribute band at Roppongi’s Abbey Road. You have a few choices when it comes to great shopping in Roppongi. Tokyo Midtown is perfect for high-end shoppers, especially at Galleria, the main shopping area. A stunningly modern and spacious four-story building, with a large number of boutiques and restaurants, you won’t be disappointed. It’s directly connected to the Roppongi Station, so easily accessible from other districts in Tokyo. Everything Snoopy. Recently opened, visitors have the opportunity to view the artworks and original cartoons (Peanuts) at the Snoopy Museum. Only a 7-minute walk from the Roppongi station, it's a fun afternoon with the kids and a good spot for souvenirs. Plus the playful menu at Café Blanket is a nice treat. Perfect for the night-owls who love a good dance, and mingle with other international travellers. Like all things in Tokyo, there is a district for buying ski & snowboard gear. Located in the Chioyoda Ward just north east of the Imperial Palace, the Kanda-Ogawamachi sports district has dozens of sport stores selling all sorts of gear and equipment, including some cute boutiques. Some of these stores are huge and there is certainly a large range to choose from, particularly for snowboard gear. It can get a bit overwhelming so be warned if you have small kids in tow. Sadly it isn't heavily discounted or cheap - prices are similar to those in Australia. To get there catch the metro to the Ogawamachi or Jimbocho Metro stations. The main stores lie on a 400 m stretch of Yasukuni-dori Avenue between Surugadaishita and Ogawamachi intersections. Some of the side streets contain the more boutique and unique gear. Add a stop-over in Tokyo as part of a Japan Ski Package on Scout.